Hi all, I’m going for a quadruple whammy for this post - 4 challenges in one. I've been doing some more doodling and came up with "Gretyl" a little witch on a broom for Halloween. She's no good sitting on my laptop so I decided to make a card and it just so happens that there are a few challenges that will work for her. 1. The first is CPS #137. 2. The next, ABC F is for Flying which fits in perfect with my witch (OCT 27). 3. Then there is 365 Card's Tuesday challenge is In Motion. 4. And seeing as my witch "Gretyl" is digital I thought I'd enter her at Digital Tuesday challenge BOO! 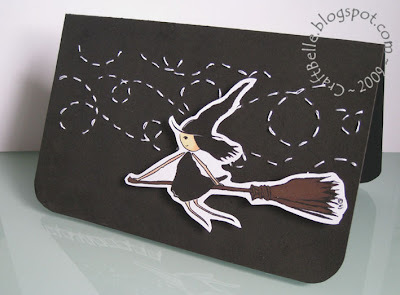 - make a Halloween card. So, here is my card. I rotated the sketch to be landscape. For the horizontal element, I hand added stitched some abstract clouds/wind in the same style as my "Little Owl" card - see here. I coloured, printed, and cut my digital witch "Gretyl" for the main element and popped her up with foam pads. I think she's having a great time flying around. If you'd like Gretyl for yourself you can download her here or see the link in my sidebar. NB. This is for personal use only ;-). Please give credit to CraftBelle and link back here. Enjoy! Oh I love it! LOVE the stitching! How creative....and the witch is super cute! Lovely card that image is perfect for our challenge at Digital Tuesday thank you so much for joining us. This is beautiful. Love the design and its a great take on the challenge. Thanks for taking part in the ABC Challenge this week. Wow, can't believe you were able to incorporate 4 challenges, way to go! 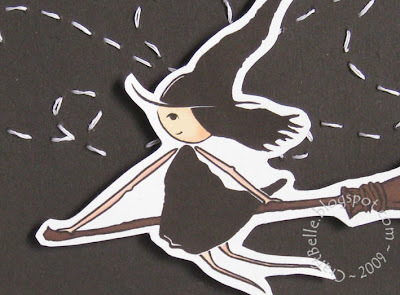 The little witch and stitching is so cute! Oh - I just love a good combo card, and this one is fab with all that stitching to create wind! Great card, I'm sorry I missed seeing it during the week. Congratulations. A worthy winner! This is fantastic. Congrats on the Top Trio at 365 Cards! Cute card! love the stitching too! Thanks for taking part in the ABC Challenge this week.